FREMONT, Calif. – April 16, 2012 – Intematix, a leading innovator of patented phosphors and phosphor components for high-quality LED lighting, today announced the release of ChromaLit XT, the latest product in the award-winning ChromaLit™ line of remote phosphor technology. An exciting lighting design trend because it increases light quality and lowers systems costs, ChromaLit makes lighting better using a phosphor composite substrate separated from the blue LEDs. 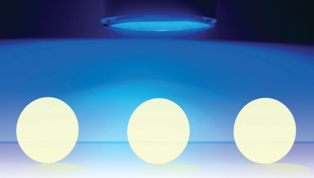 Improving on the conventional approach where phosphor coats the blue LEDs directly, ChromaLit offers glare-free, diffuse light, high color rendering and consistent light quality. By only using a blue LED engine instead of binned white LEDs, production is streamlined and inventories are reduced. Furthermore, system efficacy is increased up to 30%, reducing lighting system material cost and power consumption. ChromaLit XT offers a powerful and elegant solution for new applications like spotlights and floods, extending ChromaLit technology’s light quality and adding higher light intensity, 65% lower cost per lumen and enhanced off-state neutral color when compared to conventional remote phosphors that are yellow in color. ChromaLit XT will be on display for the first time at the Light+Building trade fair in Frankfurt, Germany from April 15-20. ChromaLit XT is optically treated to maintain an off-state neutral appearance in order to look as good off as it does on – perfect for lighting designers. The added design freedom of ChromaLit XT means users can let exposed lights like pendant lamps and downlights integrate with the rest of the space without sacrificing the high performance of ChromaLit. In highly visual environments like restaurants and hotels, ChromaLit XT allows fixtures to complement the design flow. ChromaLit XT can also be used to make lighting better outdoors and meets UL standards and is offered in a wide range of CCT and CRI options. ChromaLit recently won a Product Innovation Award from Architectural SSL magazine in the “Arrays/Light Sources” category. ChromaLit XT will also be on display at LIGHTFAIR in Las Vegas from May 9-11. ChromaLit XT products are now available through Intematix sales and distribution partners Future Lighting Solutions and Digi-Key Corporation. For more information, please contact your sales person or visit www.intematix.com. Vexica Technology is a British based company focused on the design and supply of high power “Solid State” based solutions for lighting industry product integration. Vexica’s core focus is to design, develop and deliver energy efficient more environmentally friendly LED based lighting solutions. Vexica offer a myriad of solutions that can be tailored specifically to an individual OEM requirement. Our core competencies include thermal design, thermal analysis, electronic LED driver design, reflector technology and LED light engine integration for multiple industries. Intematix Corporation is a materials development innovator, providing customizable, patented phosphors and remote phosphor components that serve as the foundation for high quality, energy efficient LED light. Intematix products enable attractive, vivid color quality, superior consistency, uniformity, and stability. Headquartered in Fremont, California, Intematix maintains R&D, manufacturing, business and support operations in the United States, Asia and Europe. To learn more about the company, please visit www.intematix.com.